We have a while to track this one, but we have two possibilities here atm: A fish or a US hit. 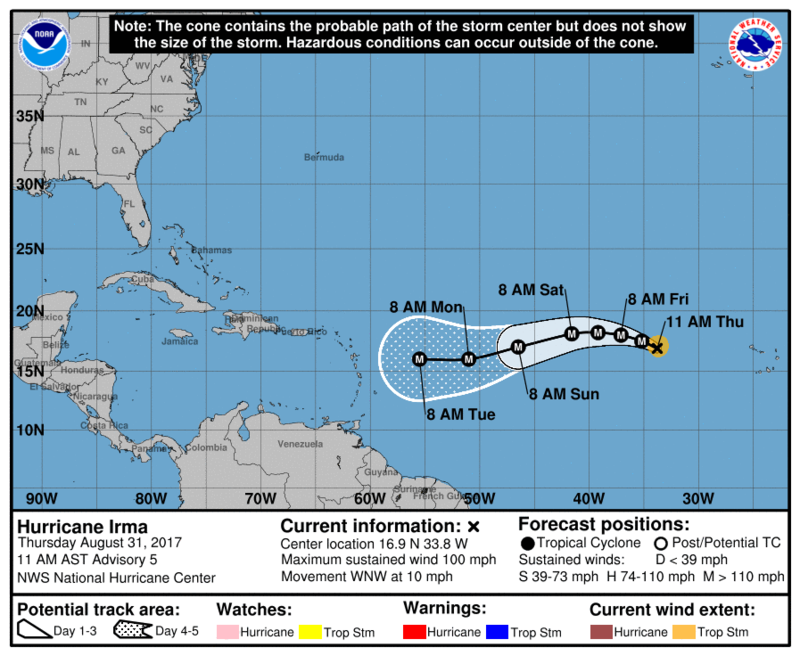 Irma has been upgraded from a tropical storm to a Category 2 hurricane. This sucker means business. Irma is now an extremely powerful Category 5 hurricane. It is now the second strongest hurricane on record (as far as wind speed goes) in the Atlantic Ocean with winds of 185mph and wind gusts that exceed 200mph! Hurricane Allen is #1 with max winds of 190mph at it's peak (1980). Irma is also the strongest Atlantic hurricane east of 60W on record. I was not happy at all when Irma hit southwestern Florida, a portion of the state that I hold dear and has a special place in my heart. But at least it was not a Category 5 with nearly 200 mph winds when it made landfall there.